Tens of millions of young Americans have taken the PSAT over the years. Over three million high school juniors and seniors took the exam in 2008 alone. A few 7th graders, 8th graders, and 9th graders are allowed to take the test each year, but the vast majority of students who take it are in 10th or 11th grade. The test is actually given at and administered by high schools, although it is owned and operated by the College Board and the National Merit Scholarship Corporation. The test actually serves several purposes. First and foremost, it prepares students for the SAT, the most common college application test in the US. Prepare with our PSAT Study Guide and Practice Questions. Print or eBook. Guaranteed to raise your score. Get started today! Since many of these students will be taking the SAT in a year or two, and because the PSAT is designed to be very similar to the SAT, it’s a great way to prepare for the SAT. Second, students can qualify for scholarship money, including full, four year scholarships, if their PSAT scores are high enough. Third, the feedback students receive after taking the test helps them identify their strengths and weaknesses, so they can use the information to improve academically. Fourth, they can also learn more about colleges and universities they’re interested in. PSAT Flashcards. Proven PSAT test flashcards raise your score on the PSAT test. Guaranteed. There are three sections on the PSAT: Writing Skills, Critical Reading, and Math. Each section is scored from 20 to 80, meaning the highest possible score is a 240. Students have two hours and ten minutes to complete the entire test. There is a lot of anxiety about the PSAT, and this is understandable, as students with the highest scores can qualify for a lot of scholarship money (and get their name and picture in the local paper). However, most students would do well to relax as much as possible so they can do their very best, and get as much as they possibly can out of their PSAT experience, in order to learn from it so they can be as well prepared as possible for the SAT. For most students, the SAT is the really important test, and there is a lot of scholarship money riding on it, too, as well as chances of being admitted to elite colleges. It’s best not to worry too much over the PSAT, but use it as a stepping stone to success on the SAT. Taking numerous PSAT practice tests is recommended for test day success. 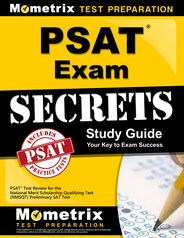 Explore our free PSAT review provided by Mometrix. Check out our premium PSAT study guide to take your studying to the next level. If you benefit from these materials, just click the link below! 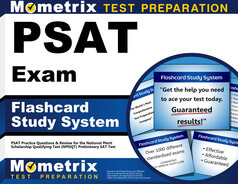 To compliment our PSAT book, we also offer extensive PSAT flashcards for even more PSAT test prep help. We hope you enjoy our products! Your purchase helps us make more great, free content for test-takers just like yourself.